Last night was a blast! Halloween is, by far, my husbands favorite holiday. He loves to decorate, he loves to see the costumes, and he loves to watch me hand out candy so he doesn’t have to do it. This year was spent with our normal family traditions: eating big macs (a tradition passed down from David’s father), watching scary movies, and enjoying our decorations. 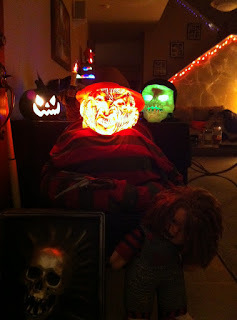 Yes, our decorations are fun, and for many kids they are scary. We always have kids who have to bring mom/dad to the door because they are too scared to go alone, and we have other kids who hesitantly walk up on their own (parents laughing in the background), and they sit there and stare. This year we actually had a child try to come in our door to touch the decorations, and we had another girl who was so impressed with “Feddie Koogles” that she kept asking everyone to come see him. A little different than last year, and you can see our orange and purple lights in the background on the walls. Also you can see the awesome cobwebs that David put all over the lower wall. Oddly, we had a lot of kids pass our house up this year as well. We’ve never had that happen before, but apparently other adults had the same issue. I’m not sure if kids just are unsure of how to trick-or-treat anymore or what. Although our trick-or-treat hours started at 3:30 so many people weren’t even home. Overall, we had a great time and we were out of candy by the end of the night! I always enjoy our Halloween celebrations, and I’m not sure what will happen once we have a kid. I’m sure they will change quite a lot. Since it’s November 1, it is time to start my “what I’m thankful for. . . ” each day I post this month. I have so much to be grateful for that it is quite hard to pick out just one thing to celebrate with each post so sometimes I will have more than one. Today is one of those days. Today (and everyday) I am thankful for God. I have received many blessings recently, and I know that He is responsible for them all. I am overwhelmed by His love and power, and I don’t know what I’d do without Him being such a big part of our lives. We are so blessed each and every day. Today (and everyday) I am also thankful for my husband. David has been working very hard recently, and he has been helping me pick up some slack at home when I’m not feeling well. He has basically been running the house and managing a full-time job on top of it. I am so impressed by his dedication and love to me, and I wish I could do more for him. As November continues, I encourage everyone to take a minute and think about what you are thankful for today! !